On to my favourite topic, food. Well, seeing as how we were up in the arctic wilderness, having close shaves with roaming moose and reindeer, I mean, it only made sense to…you know. What do I know, you ask? Well…eat, I say. 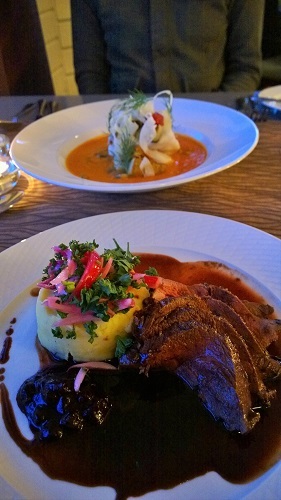 Eat moose and reindeer that is. 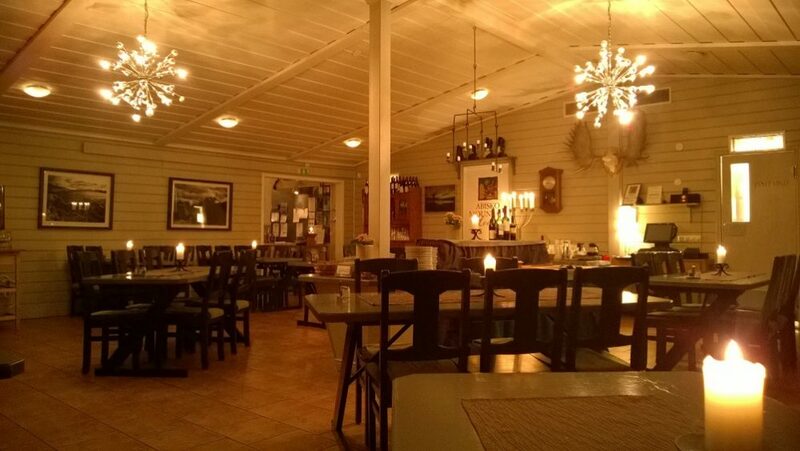 And the lodge we stayed in, Abisko Mountain Lodge, does this pretty well. 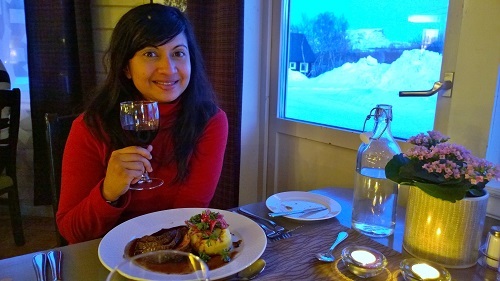 I wasn’t expecting much, seeing as how there are only about 3 options of where to stay in Abisko, but this lodge fared pretty well. Rooms are basic, small and spartan but really, you wouldn’t waste your time hiding out in your room when you’ve made your way all the way up to the arctic circle. But the reception and dining area – now that’s another story. Comfy, spacious and charmingly anointed with all manner of arctic wilderness décor (yeah, I’m talking about you, Mr Moosehead), this is where breakfast, a simple lunch and dinner is served. And they are all actually pretty good. And so, no northern lights for us. But for some reason, well I know the reason, and the reason is “well, if I didn’t see the lights this year, it just means I’d have to return next year!”, I left the lodge, the Arctic circle, buzzing from the husky sled ride, the snowy walk across a frozen, desolate landscape and…promptly fell on my arse. 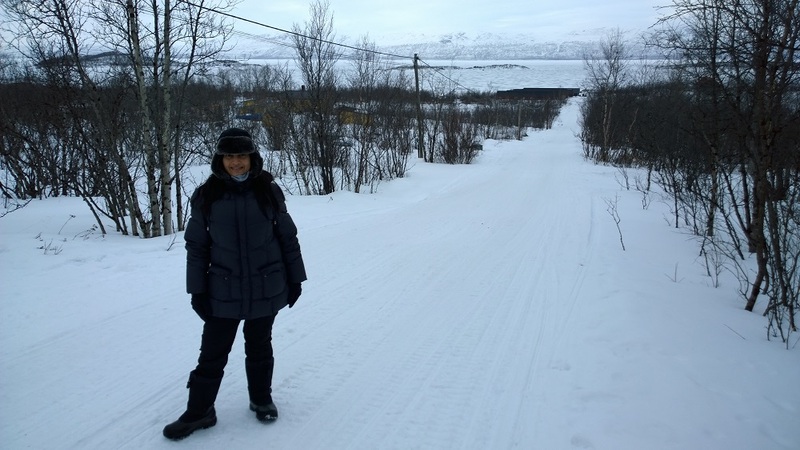 In case you missed it, here’s my Abisko Adventures (Part One). And in case you are interested, you can read my Reykjavik writeup where I actually did see the Northern Lights! We flew in from Stockholm to Kiruna, where we stayed at the Icehotel. But the point is, you can take a direct bus no. 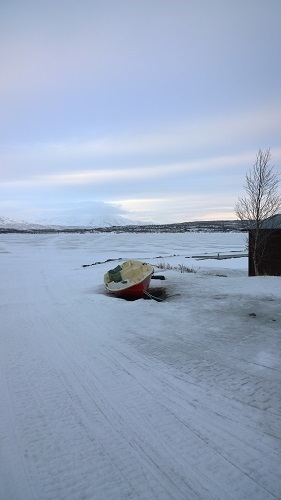 91 – about 1 ½ hours ride to Abisko from Kiruna airport. Bus stops you at a largish petrol station, also referred to as the tourist station, from where you walk to the lodge, about 15 mins with heavy suitcase and in the snow. Just make sure that you check the bus timetables for the day of your travel, as there seems to be only one bus departure each day, so you really need to coordinate your arrival time at Kiruna airport and time of bus departure. To be honest, the process wasn’t as easy as they don’t release the bus schedules online months in advance, so if you book your air travel ticket in advance, just make sure you book as early an arrival by air as possible so that at least you won’t miss the bus. We flew in early enough to catch the bus which on that day was at 1.30pm. You can book the bus trip online or pay onboard – it’s about 400 SEK roundtrip. Although the lodge didn’t offer us transfer to and from the bus station, read a more recent review on Tripadvisor that says this could be arranged. Good to know, so you don’t end up falling on your arse, trudging through the sleet and snow on your way back to the bus stop. Speaking of bus stop – just be conscious of the fact that sometimes the bus stops only along the main road, sometimes it turns into the petrol station. You don’t want to miss the bus, so if you’re in a pair or group, best one waits on main road and the other at the station. In our case, we were told it stops along the road, so better wait on the road just in case we are at the station, and it just drives by. But nope, the bus drove right past us on the road and entered the station, so we had to make like a snow leopard and dash up to the station. Make your bookings for the sled rides, snowshoe hikes etc in advance. Heard that sometimes tours get booked up and because this isn’t a very big, commercial kind of area, maximum capacity is just that. 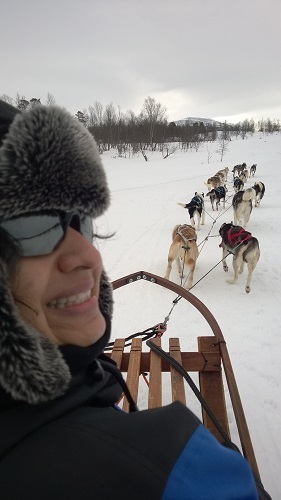 You can make your bookings via the Abisko Mountain Lodge people. The lodge provides you with all the cold wear (hats, gloves, snowsuit and boots) free of charge, and it is a godsend. So don’t worry too much if you come from the tropics and don’t own any of these items – what you own most probably wouldn’t suffice anyway. There is a convenience store near the lodge, so in a pinch, if you need snacks or toiletries etc, you can buy.